Supersecondary structure code (SSSC), which is represented as the combination of α-helix-type (SSSC: H), β-sheet-type (SSSC: S), the other (SSSC: T), and disorder residue or C-terminal (SSSC: D) patterns, has been produced by the developed concept of Ramachandran plot, in addition, with the ω angle and with the specification of positions of torsion angles in a protein by the registration of codes for torsion angles of each amino acid peptide unit, derived from the fuzzy search of structural code homology using the template patterns 3a5c4a (SSSC: H) and 6c4a4a (SSSC: S) with conformational codes. The DSSP (Dictionary of Secondary Structure in Proteins) method assigns the secondary structure including hydrogen bond well. In contrast, supersecondary structure code is very sensitive to the supersecondary structures of proteins. 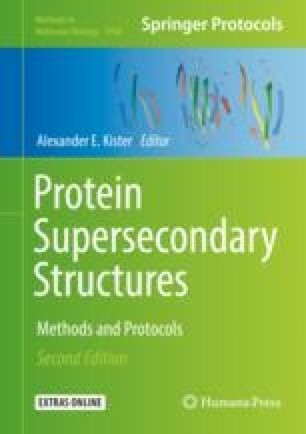 In this chapter, the protocol of homology search methods, the sequence alignment using supersecondary structure code, the assignment of supersecondary structure code T, the fuzzy search using supersecondary structure code, and the exact search using supersecondary structure code are described. Supersecondary structure code is variable with the conformational change. If possible, many Protein Data Bank (PDB) data of similar main chains of proteins should be used for the homology searches. The thorough check of SSSC sequences is also useful to reveal the role of target pattern. This work was partly supported by JSPS KAKENHI Grant Number JP16K05711. The author thanks Dr. Rina K. Dukor and Professor Laurence A. Nafie for the discussion of supersecondary structure code.